Winter Lessons, open all year! 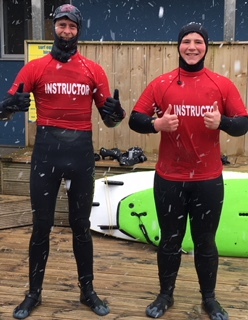 So from the 1st December we are on our winter schedule for lessons; This means we have private lessons whenever you want until 1st Feb 2019 and then group lessons re-start. Now Xmas and New Year gets booked up super early, normally by customers who have decided that the usual naked New Years day skinny dip is for fools and drunk people. However add a nice thick winter wetsuit, accessories and a surfboard and it is a super cool activity of the sober. Plus a great talking point and an excellent way to burn off the extra mince pies and sausage rolls that were surplus to your 5 a day. So we are here and waiting for you, just send an email and we can reserve your place on the lesson plan. See you all soon amigos. (The Pic is the Chuckle Brothers from last winter).